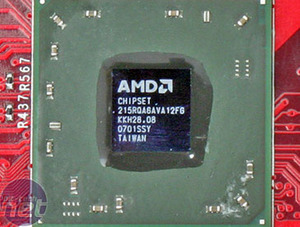 This week AMD released its (long time delayed) RS690 chipset. 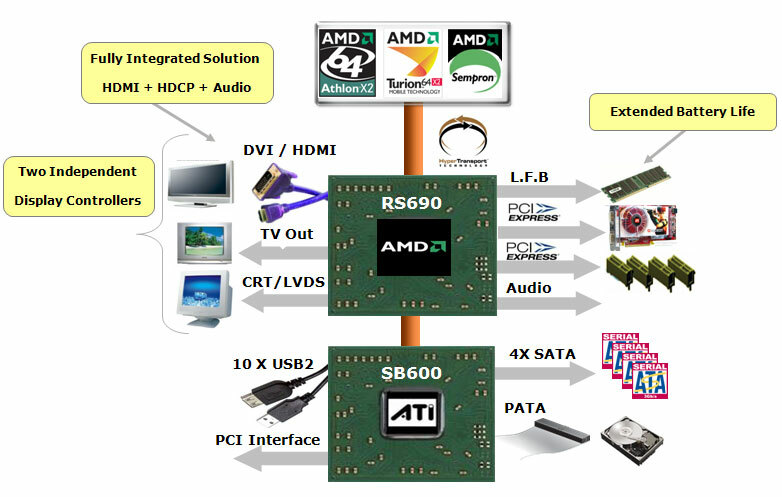 As the first chipset to come out of the merger between AMD and ATI, we now have a “powerful” integrated chipset that offers Avivo video post processing, HDMI, DVI and HDCP support. 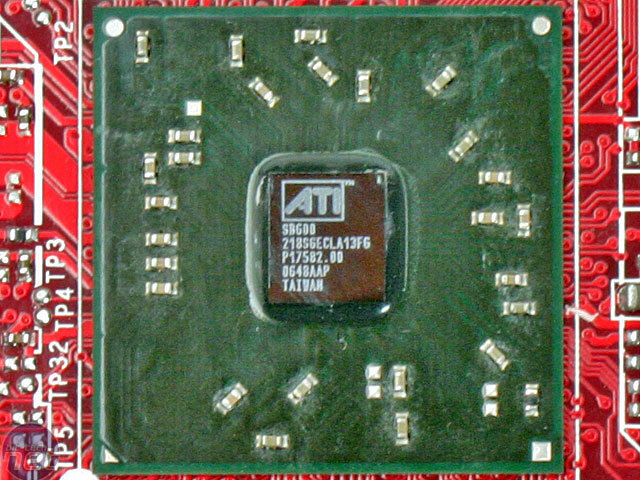 Initially, it was an ATI chipset pegged for launch this time last year, but it was delayed because of delays to ATI's SB600 southbridge, and then there was AMD's acquisition of ATI that made things a little difficult. Finally, there were rumoured licensing issues with HDMI, where not only does AMD have to have a license to launch a product with HDMI, but each individual company who uses the product also has to have a license as well. With all of the shenanigans out of the way, RS690 is finally here. It offers integrated graphics performance far in excess of Intel’s offerings which should make OEMs love to include it in their cost-concious Vista-ready PCs. Currently, we don't have Nvidia's competing product, nForce430 / GeForce 6150, in house - we'll be saving comparisons with that particular solution for an upcoming review. 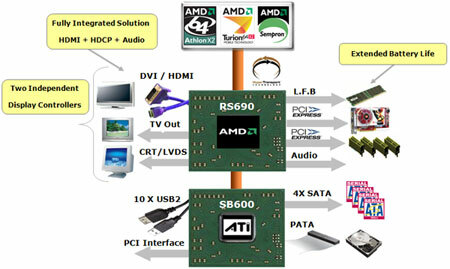 Join us as we delve into what's behind AMD's 690-series chipset. Local Frame Buffer and HyperMemory support on the M690G. 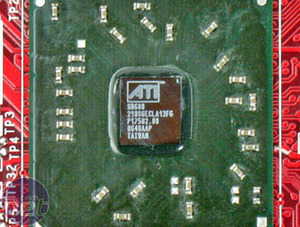 ATI's last integrated chipset was the RS480, which was based around the X300 graphics core. Whilst this was far from being a graphical power house, you could still play Half-Life 2 and a fair few other games with enough FPS not to suffer a slideshow or become cannon fodder. With RS690, the graphics core has been upgraded to an X700 core and thus, there’s significantly more horsepower to play with. Having said that though, it’s still a far way off any current generation GPU. Despite being re-branded to Radeon X1250 it isn’t derived from the X1000-series architecture: the highest Shader Model supported is 2.0b. 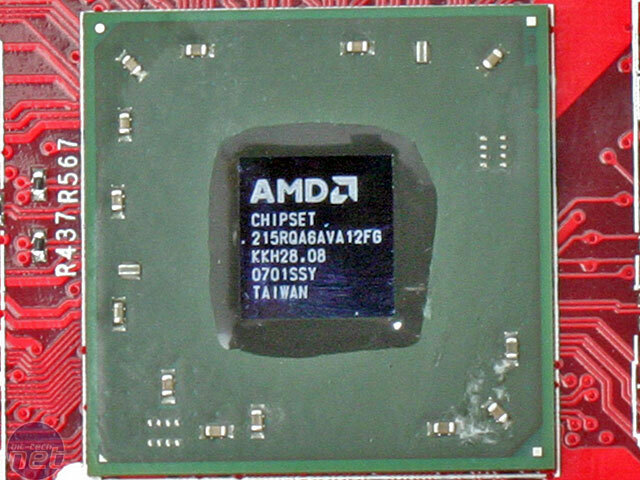 This is in comparison to cards in the X1300 series (and above), which have support for Shader Model 3.0. There’s full support across AMD's range of processors, although this is likely to be an AM2 only chipset considering socket 754 has a very limited life left and DDR3 will be exceptionally expensive when AM2+ hits later this year. Despite AM2+ coming with support for HyperTransport 3.0, RS690 only supports the current HyperTransport 2.0 specification. We're also told that AM2+ is going to be backward compatible with HyperTransport 2.0 specification. There are 24 PCI-Express lanes in the northbridge, 16 are available for a PCI-Express x16 graphics slot, while another four are to be used for things like PCI-Express x1 slots and integrated components like Gigabit Ethernet. The remaining four PCI-Express lanes are dedicated to the A-Link II northbridge-southbridge link which connects to the SB600 southbridge. The SB600 southbridge hasn't changed since its inception. It has support for PCI, four SATA 3Gbps with RAID 0, 1, 0+1 support, High-Definition audio, a single IDE port and ten USB 2.0 ports. AMD told us that manufacturers prefer not having Ethernet MAC built in like Nvidia’s physical layer solution. We were told that its partners prefer the option of including their own Ethernet, because they have their own deals with chip distributors. All of the PCI-Express connections are from the northbridge, so the four lanes of interlink bandwidth aren’t saturated by PCI-Express usage from the southbridge. This also makes the PCI-Express connections a link closer to the CPU and that helps to provide less calculation latency. Although for DMA access everything still has to go through the CPU because of the on-board memory controller. Obviously, this is different on Intel boards that can access memory directly from the northbridge - it's horses for courses as to which is the better solution, though. The inclusion of support for HDMI with HDCP is a massive bonus, because it means both high resolution video and high definition audio can be passed across a single cable. Although it’s up to the motherboard manufacturer to include the HDMI connector on the rear I/O panel, the chipset supports the latest audio and video capabilities with HDMI v1.3 and HDCP v1.1 compliancy. These two features alone allow RS690-based boards to display billions of colours (up to 48-bit) and uncompressed HD surround sound from Dolby TrueHD and DTS-HD Master Audio. Nvidia's MCP73 series of motherboards are being released out into the wild today with offerings from Biostar and Inno3D being made available.